We left for the House of Waterford Crystal at 9am arriving in Waterford, Ireland about 11am. After leaving the bus we entered a gift shop, Hibernian Gifts, for some browsing before our scheduled tour of the House of Waterford Crystal at 11:30am. 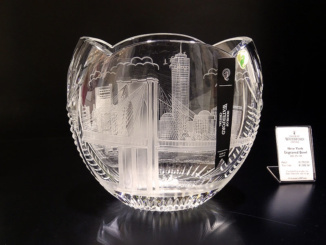 Hibernian Gifts was less than a 3 minute walk from the House of Waterford Crystal entrance. At 11:30am our tour began. 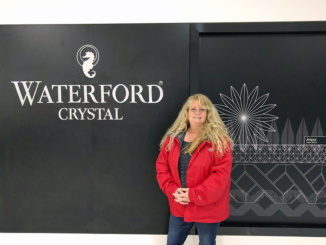 Our guides gave us some background information as we viewed a showcase of Waterford Crystal collectibles. 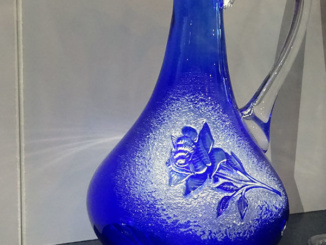 In the collection was a noteworthy blue colored water decanter. 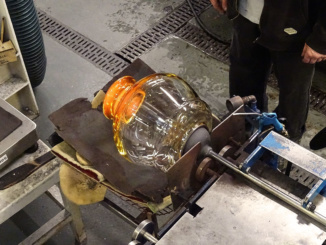 This decanter is unusual for the Waterford Crystal facility in Ireland as they only experimented with colored glass in the early years and do not produce it any longer. 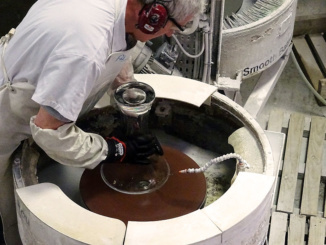 The colored glass compromises the purity of the clear crystal so it is now only produced in other facilities. We were told that only one blue and one red decanter were ever created by the designer at that facility and unfortunately that person passed away about 10 years earlier. The decanters are only on display occasionally at the House of Waterford Crystal, on loan from the family. 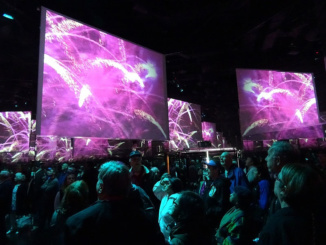 After the brief introduction, we had a short audio visual presentation showing some of the uses of Waterford Crystal. 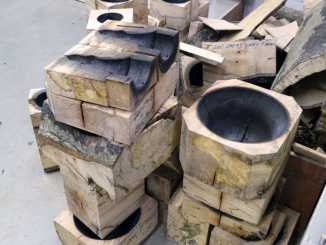 Next we entered the manufacturing facility and were told about the molding process and how those molds are designed and then carved from wood. 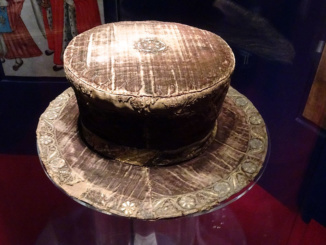 We learned that some pieces of crystal are commissioned by the upper elite and therefore may have limited runs with as few as one piece ever being made. 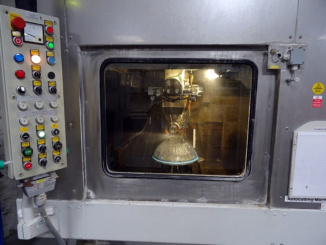 Next we went to the firing area where we watched the entire firing process beginning with super-heated liquid glass that was slowly turned into a large glass bowl. 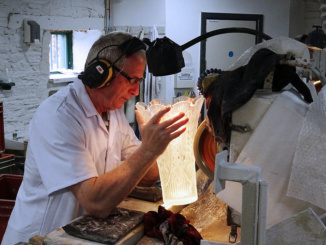 After the firing and kilning process the glass must now traverse the cutting room where large band saws and grinders are used to smooth out the glass. Then the designers draw the designs on into the piece that is then cut by the glass cutters. 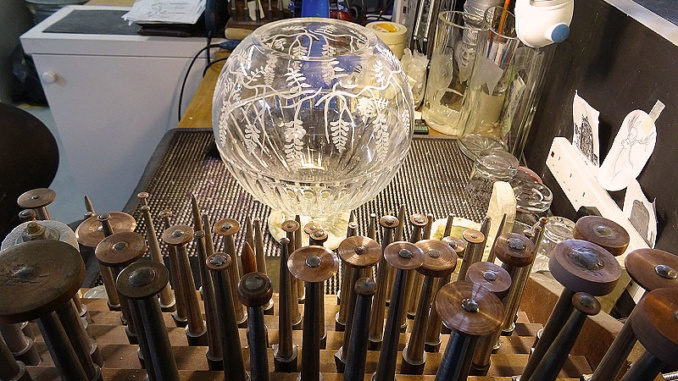 Oftentimes the craftsman will mark on the crystal with a blue marker to help divide the project into sections and allow clear starting and end points. What was nice about this tour is that we were right there with the action as opposed to being up and away from it all. 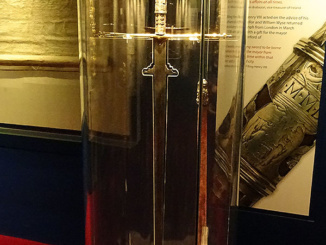 The crystal is often worked and reworked by several craftsmen depending on its ultimate complexity. Some of the more precision cuts are made by a CAD/CAM machine. Last was the Engraving and Sculpting department where names, insignia’s, and crests were placed on the glassware. 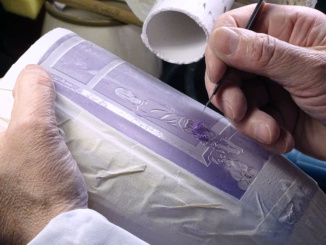 For etchings, a sandblasting process is often used. The last piece we saw at the end of the tour was the 911 Memorial Tribute with only two existing in the world. 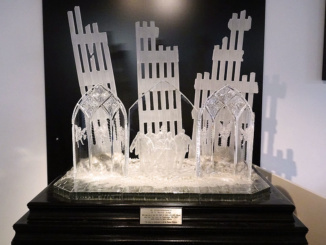 The miniature version is at the the House of Waterford Crystal, and the larger version is on display at Engine 1/Ladder 24 in Manhattan, New York. Leaving the manufacturing portion of the tour, we ended at the Gift Shop that contained amazing crystal displays and plenty of merchandise to purchase. We then had two additional hours of free time to use as we saw fit. 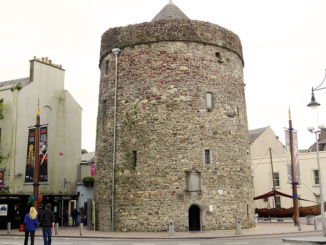 We decided to head across the street to the Medieval Museum which is one of the Trio of Waterford Museum of Treasures. Entry was 7 Euro per adult and included an audio guide. 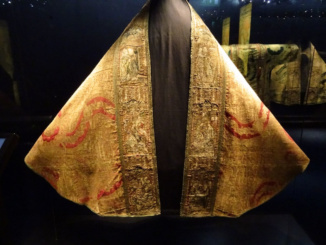 The most amazing thing housed in this museum is Europe’s only complete set of medieval cloth-of-gold vestments from the period of 1460 – 1520. 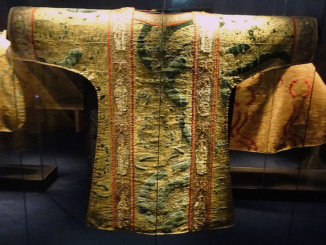 These vestments are in unbelievable condition and nicely showcased for your visual enjoyment. This display would certainly be the highlight of any visit. 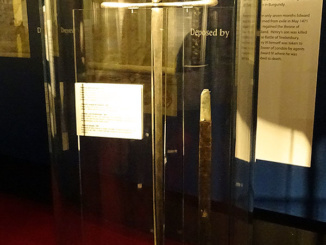 Also found in the Medieval Museum is the Sword of King Edward IV (circa 1462) and the Cap of Maintenance given by King Henry VIII in 1536 to the Mayor of Waterford. 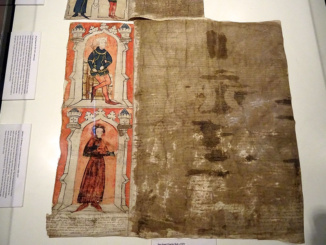 Additionally the museum holds the Great Charter Roll of 1373 which contains both the earliest contemporary portrait of a medieval English monarch and the earliest view of an Irish city. After our museum visit, we had about 30 minutes of free time remaining. Hastily we headed down the street a few blocks to Reginald’s Tower which was a Viking tower with a small museum and Audio/Visual presentation at the top. Entry to the tower was 5 Euro. 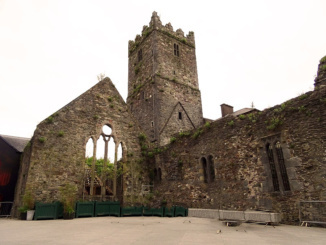 The tower was built in the middle 1200’s upon the site of a Viking fort of the period. 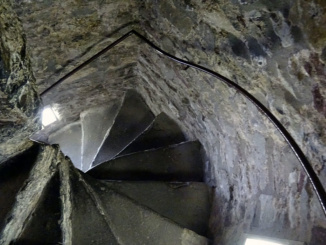 This tower was also used as a mint, besieged by Oliver Cromwell, and frequently visited by King James II. 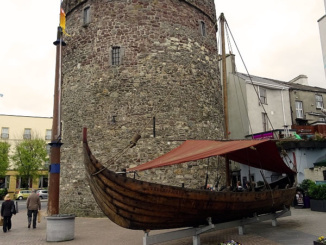 Adjacent to the tower is a replica Viking Longship. Upon leaving Reginald’s tower, we saw a large banner that read “King of the Vikings” on the side of a building that was under construction. 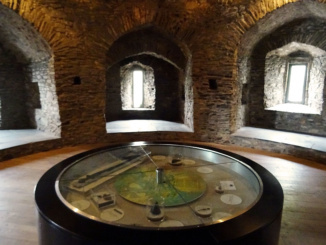 The curator of the tower informed us that a “Viking Experience” is slated to open there in the fall of 2017. After rejoining our tour group, we left for the town of Lismore at 2pm and arrived at 3pm. 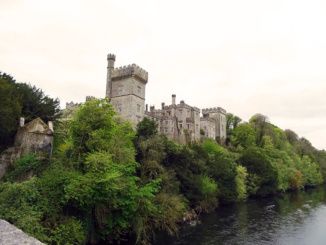 In Lismore we had one hour to walk about the town or we could tour the castle gardens for 8 Euro’s. 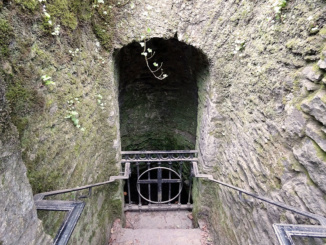 The castle itself is off limits and is private property. 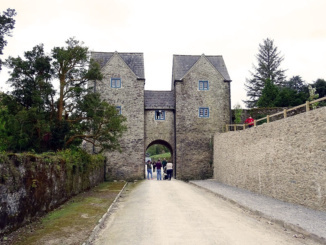 The castle was originally constructed in 1185 by Prince John for the purpose of the Lismore Abbey. 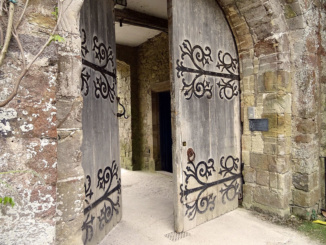 The castle was briefly occupied in the late 1500’s by Sir Walter Raleigh. We took a few photographs of the castle and walked to the gate as far as we could go. Then we headed down the street to the Blackwater Bridge for a few more photographs. At 4pm we departed for our return journey to the ship. On the drive we passed the Village of Tallow whose entire lands are also tied to Sir Walter Raleigh, a very popular figure in this region of Ireland. After arrival at the Port of Cobh (Cork) we learned that this was the last stop of the Titanic where 7 patrons disembarked. One of these lucky travelers was Father Brown who is known to have taken the most extensive collection of photos of the interior of the RMS Titanic. Also located near the Port of Cobh are the torpedoed remains of the RMS Lusitania, a large passenger ship of the Cunard line, that was sank by the Germans in 1915.